My eighth ground of 2016 was on Saturday 9th April at The Cuthbury in Wimborne Minster, Dorset. The match was Wimborne Town vs. Didcot Town in the Southern League Division One South & West. The Cuthbury is on the western edge of Wimborne and its eastern side sits directly behind the town's Victoria Hospital. 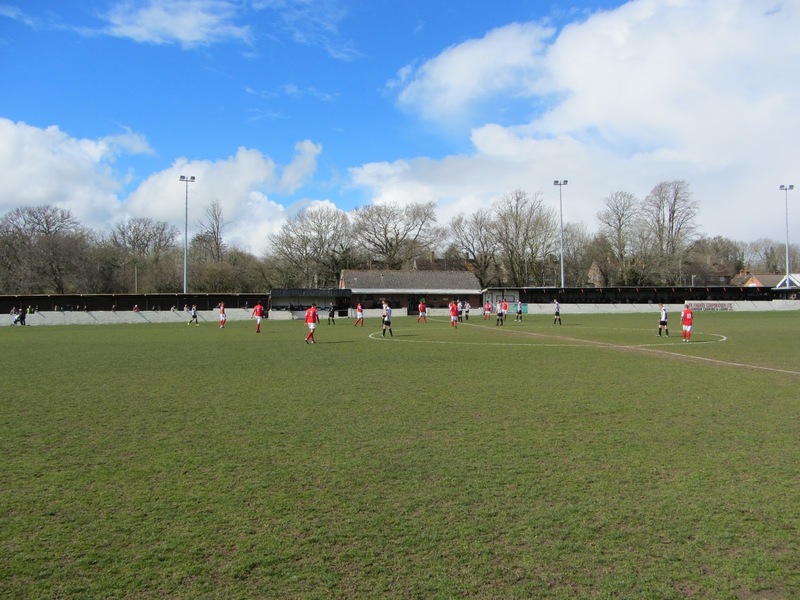 It is bordered by a mixture of housing and allotments to the north and south with an additional football pitch and then the River Stour to the west. 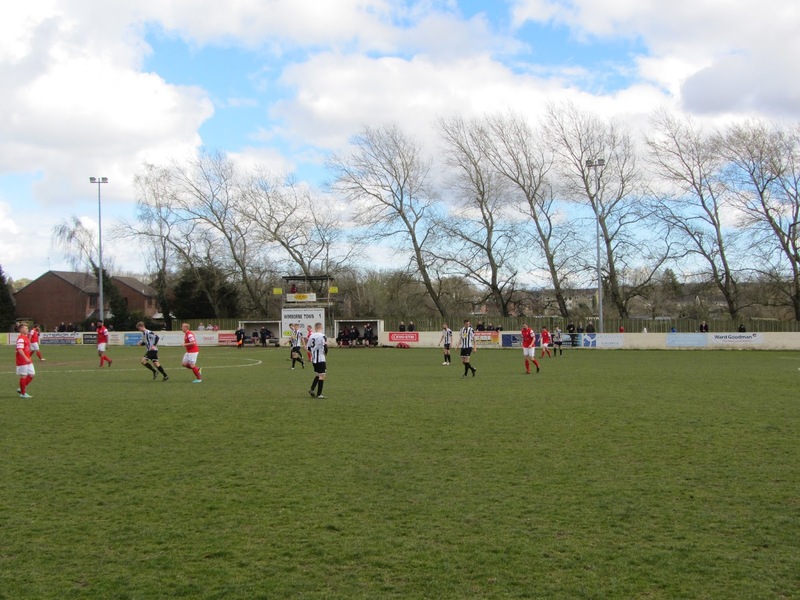 The venue is 7 miles north of the nearest railway station at Poole and has been the home of the club since they formed. The north side of the ground is a mixture of standing and seating, all of which is covered. This side is roughly split into thirds with the western third taken up with hard standing. 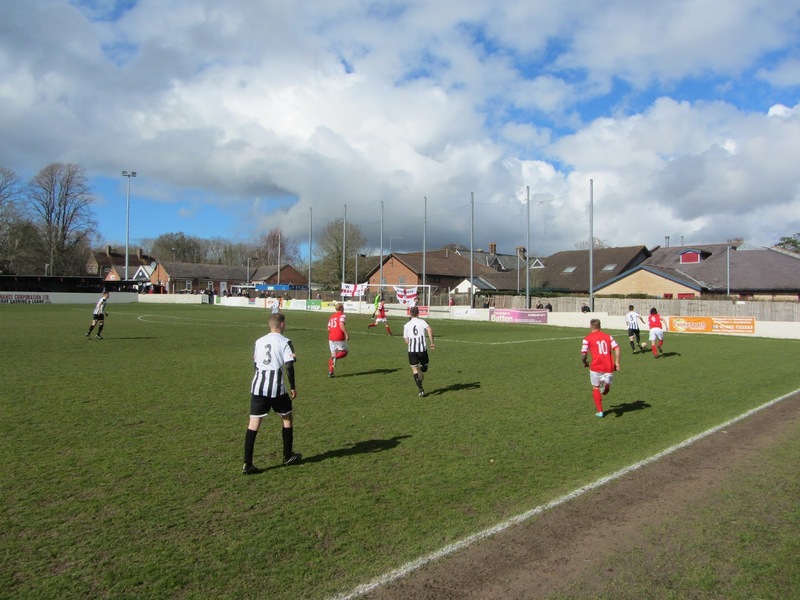 The middle section consists of the dressing rooms and a small all-seater stand with approximately 40 seats. The eastern third has a couple of rows of wooden benches. Adjacent to this is the north-east corner which includes a small club shop, a seating area with a food outlet and a nice clubhouse consisting of a pub bar and a tea bar. The pitch runs downhill towards the southern side of the venue which is all uncovered standing. In the middle of southern end are the two dugouts with a gantry on top. As with the northern end the western end of the ground is all covered though there are no seats. The area behind the eastern goal is very narrow - there is enough room for a fairly small number of people to view from but it probably more of a walkway than a spectator area. Directly behind this is netting to stop the balls going into the neighbouring hospital. Going into the game both sides were well clear of the play-offs as well as the relegation zone so didn't have to worry about anything being at stake. Wimborne took the lead in the 12th minute with the goal coming about when Billy Maybury beat Harry Beer down the left hand side and clipped a ball into the box. 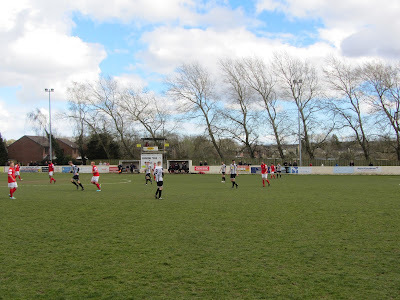 This cross was then nodded back into the six yard box and a collision between the goalkeeper, a defender and Wimborne attacker James Stokoe saw the ball bundled into the net. The hosts came close to a second in the 36th minute when the ball was worked well in the box before being chipped onto the roof of the net. The home side were on top in this first half against a flat Didcot side but just before the break the visitors drew level from a corner when Luke Carnell powered a header into the top corner. The second 45 minutes was end-to-end with wasteful finishing from both sides meaning no more goals were scored. Didcot came the closest to netting again when James Organ's header was cleared off the line with a quarter of an hour remaining.